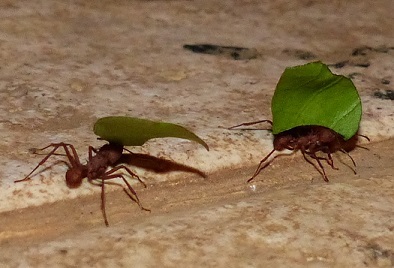 The leaf cutter ants re-invaded. pictures of the ants!) The caterpillar seemed none the worse for the last two nights escapades when I checked on it this morning though. 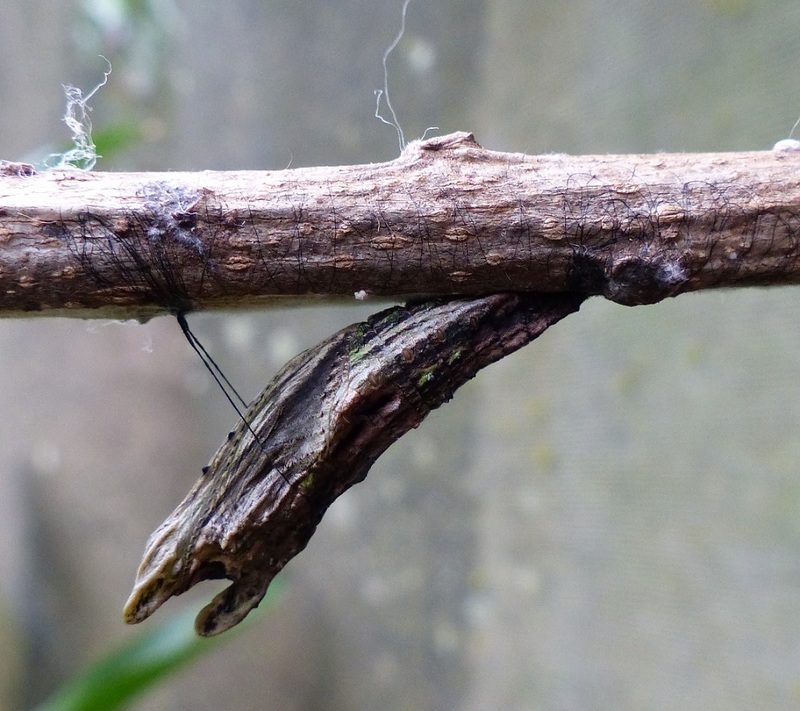 On the contrary, it seemed content as usual to move as little as possible on the branches provided while showing off its impressive new weight gain (caterpillars really do literally grow in size overnight). I had breakfast, reassured of it’s well being… only to come back an hour later and find it disappeared! Completely. I still can’t believe it. All that work and it escaped on me just as as it was about to form its chrysalis (I’m quite sure that’s why it escaped… apparently all the long sturdy branches I had made available to it were not good enough and it decided to take matters into its own…feet) It will be fine, it apparently didn’t need a food source anymore and is more than capable of finding a good place to pupate… but still all that fighting with the ants and no chrysalis to show for it?! 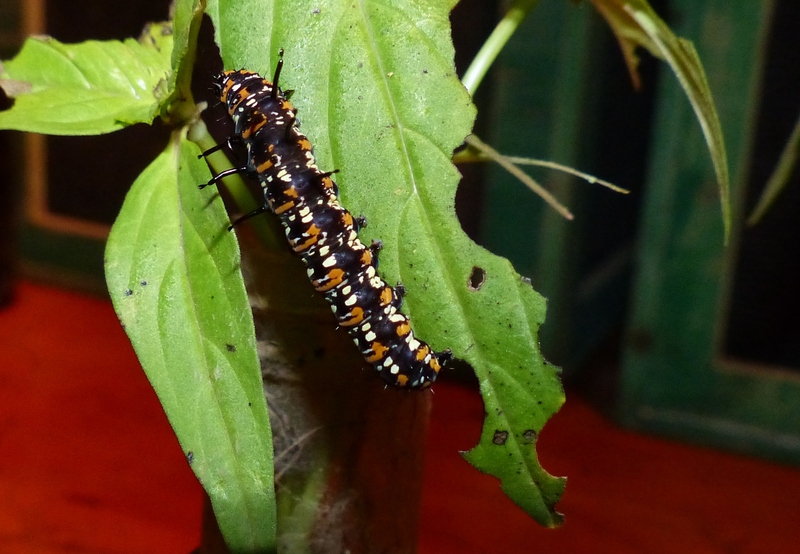 *sigh* I guess I have to figure out a better table AND a better caterpillar box next time. 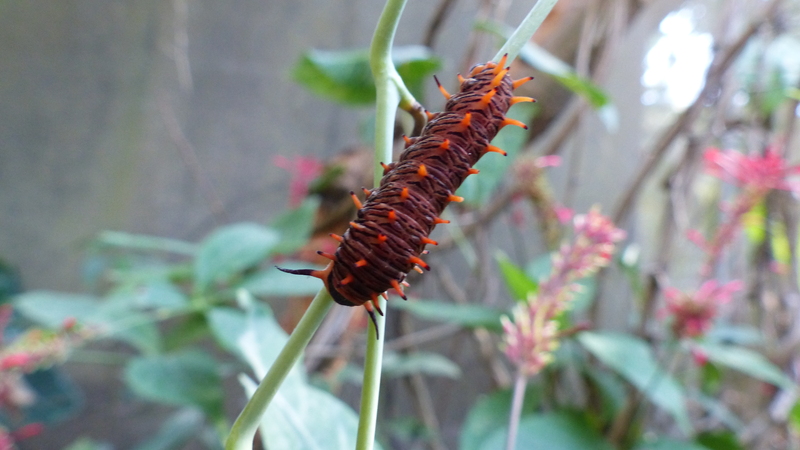 At least I have these two mystery caterpillar chrysalises to look forward to emerging… Any guesses what they’ll become? 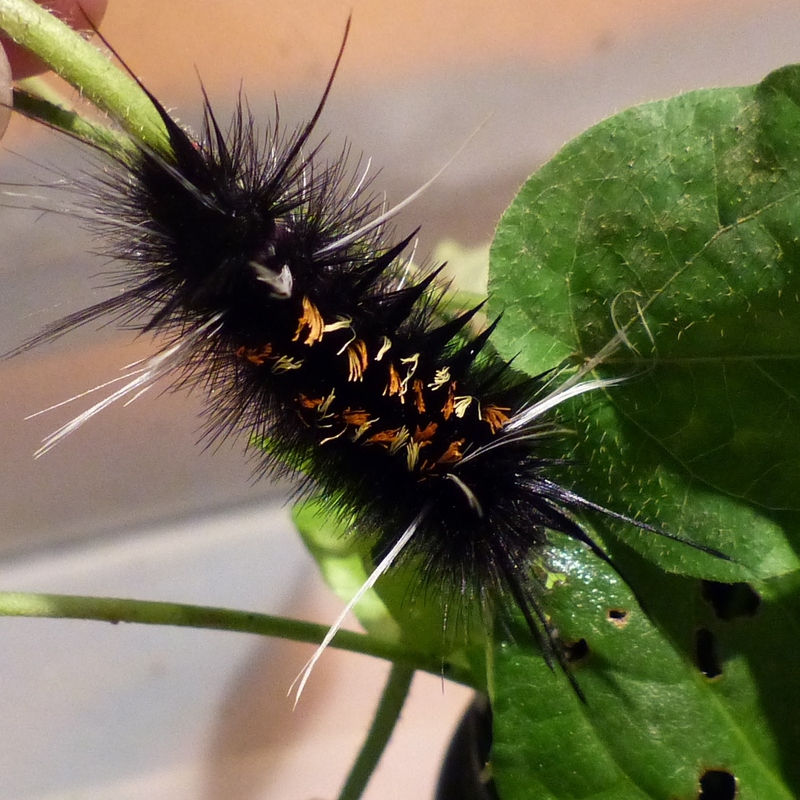 ause it stings, I’ve made sure to give it an extra large amount of its host plant (hibiscus leaves) so that I wont have to add or change out branches and jostle it in the process. 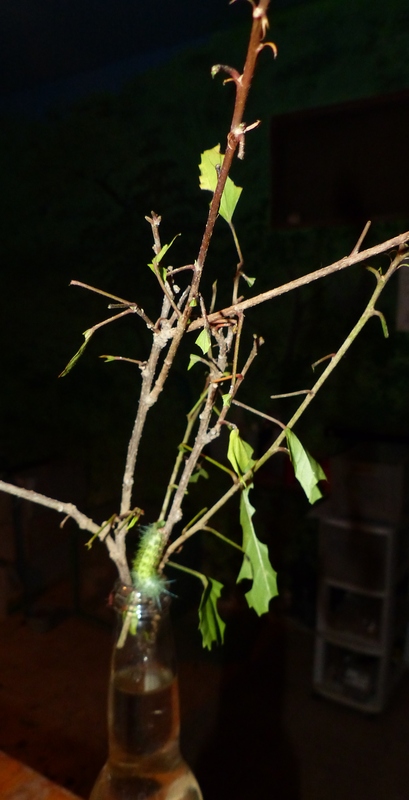 As I turn to show the caterpillar off to McKenzie, I am astonished to see that ALL of the leaves on all of branches have been stripped down to nothing! 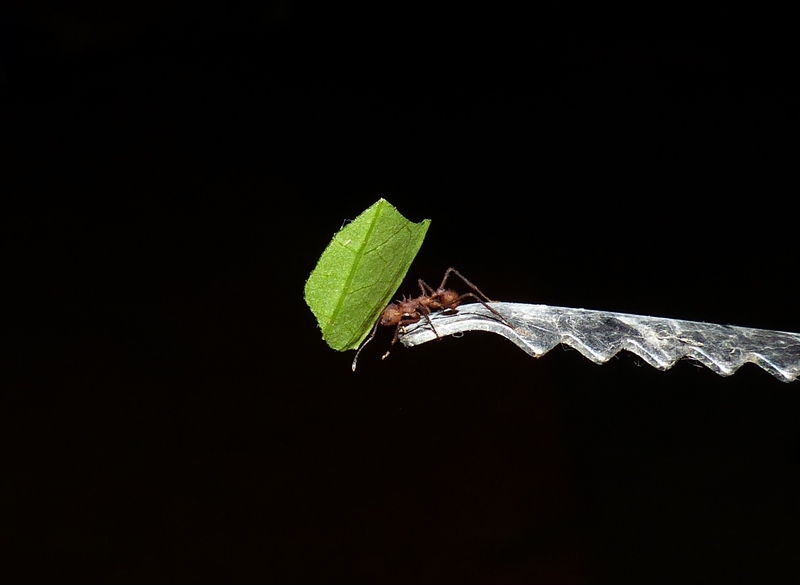 One step closer, and… the bottle is swarming with leaf cutter ants. 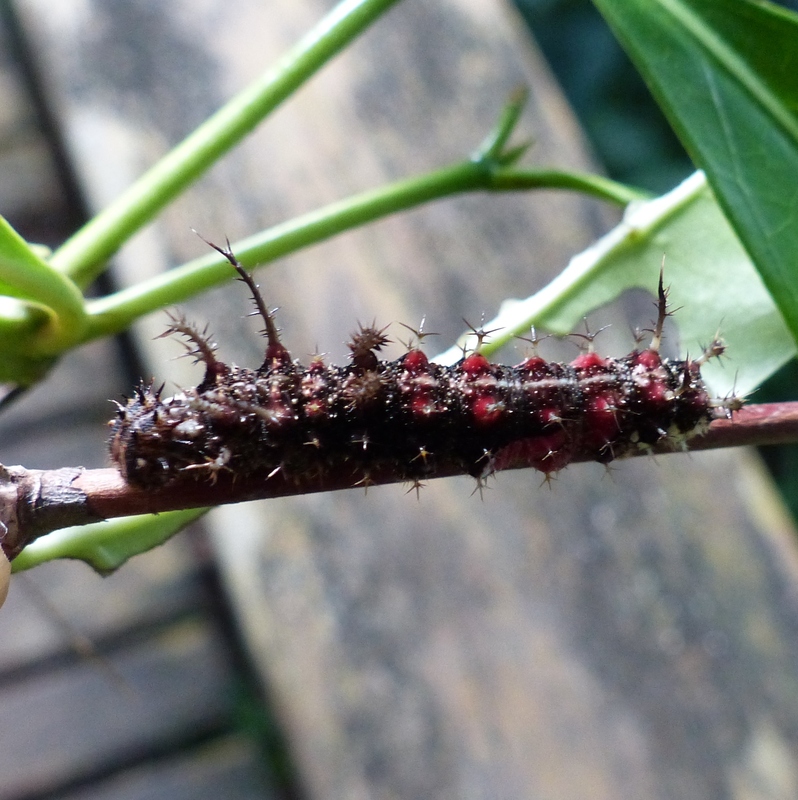 Looking down we see a line of them across the floor, trooping up the leg of the table onto the bottle and all over the hibiscus branches surrounding the poor caterpillar (who apparently doesn’t sting leaf cutter ants, even when they are devouring its only food source). I call for Josh. 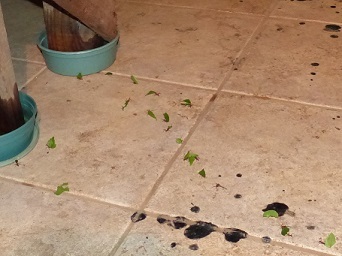 He helps me brush and shake the ants off the table and then fill plastic containers with cooking oil to put under each table leg. 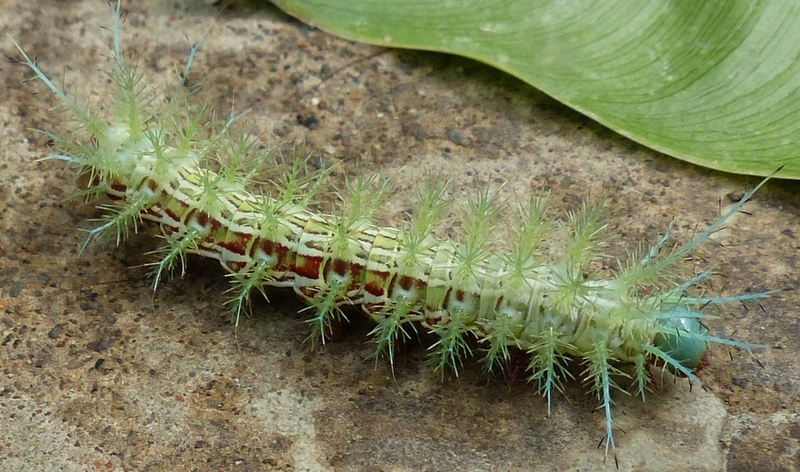 Cleaning up, I pick up one half leaf the ants left on the ground in their hasty retreat, only to discover a green caterpillar clinging to it for dear life. I didn’t even know I had this guy in the lab! 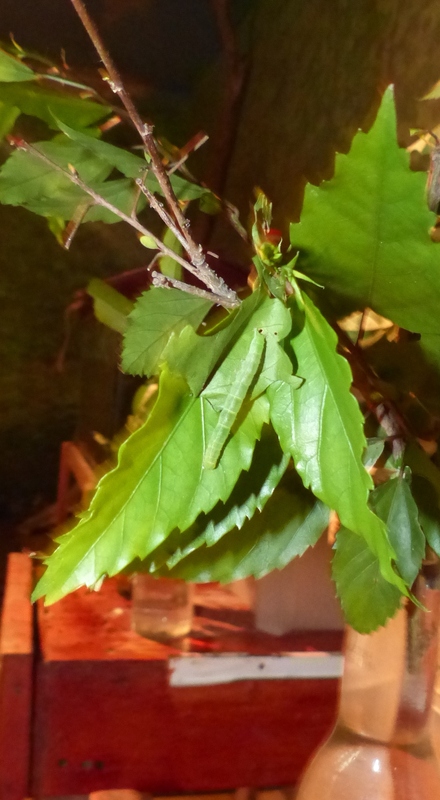 grab a headlamp and go cut some more hibiscus branches for my, not one, but two hibiscus eating mystery caterpillars. 9:15 I close up the lab . 11pm…. 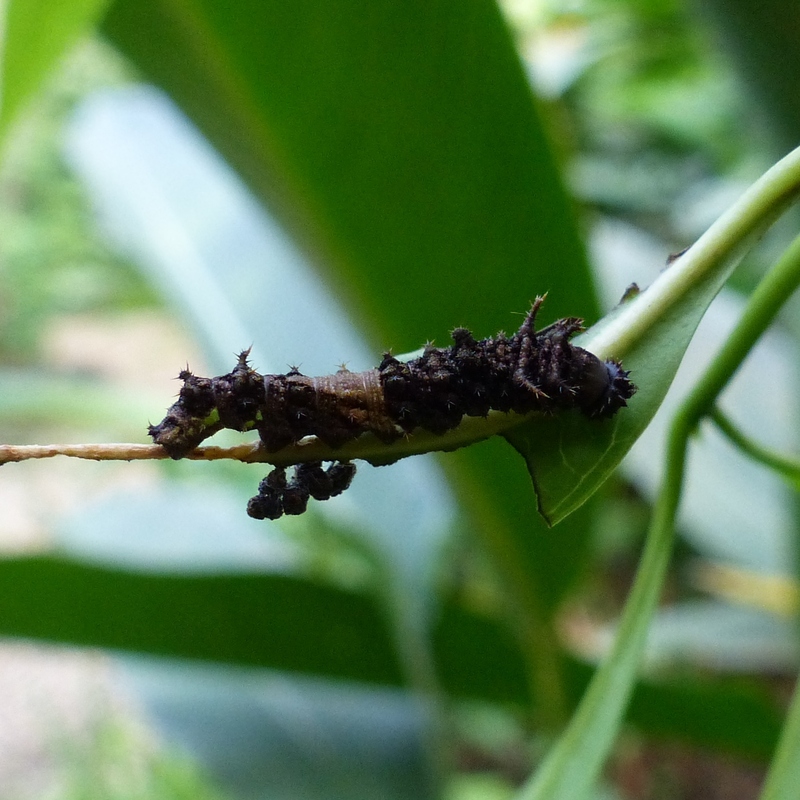 I should probably go back and check on the caterpillars…. As I said in my intro blog, my passions are latin dancing, photography, Spanish and whatever happens to have currently sparked my excitement down here. 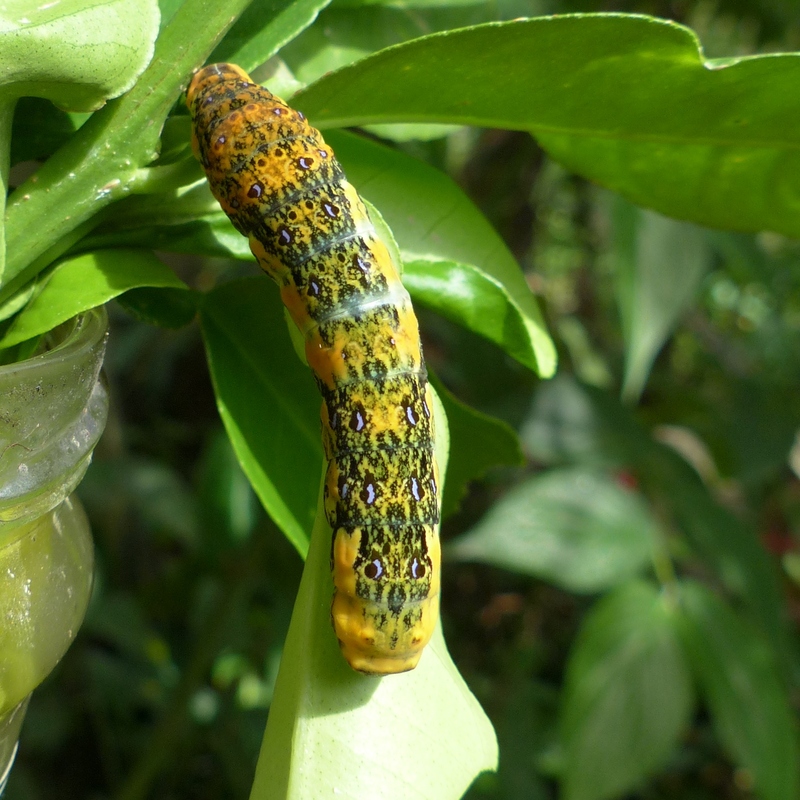 Right now it’s raising caterpillars. 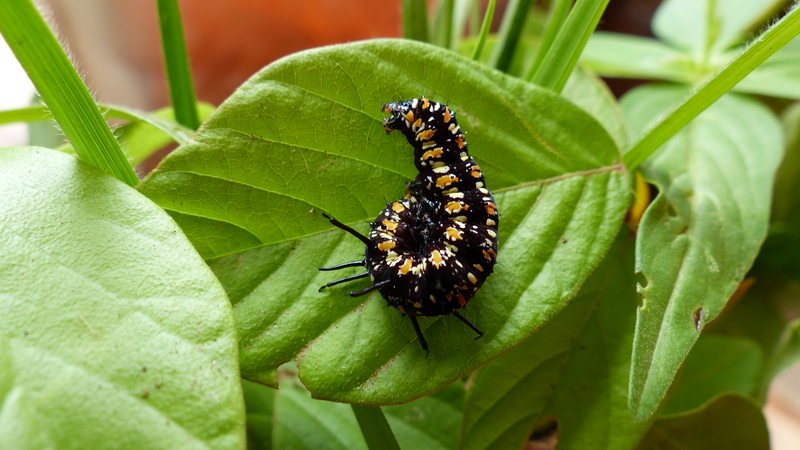 One who makes the butterfly garden its home is the battus. 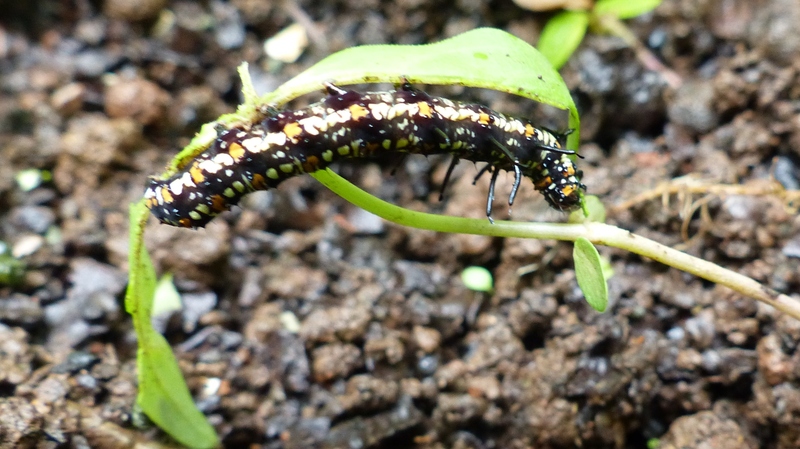 We have caterpillars in the butterfly garden of course, that live there happily, eventually metamorphosing into beautiful butterflies who flit around laying eggs on the host plants we’ve planted in the garden for them. It’s designed so that they can go through their entire life cycle naturally with little to no direct human involvement, just like they would outside of the garden. 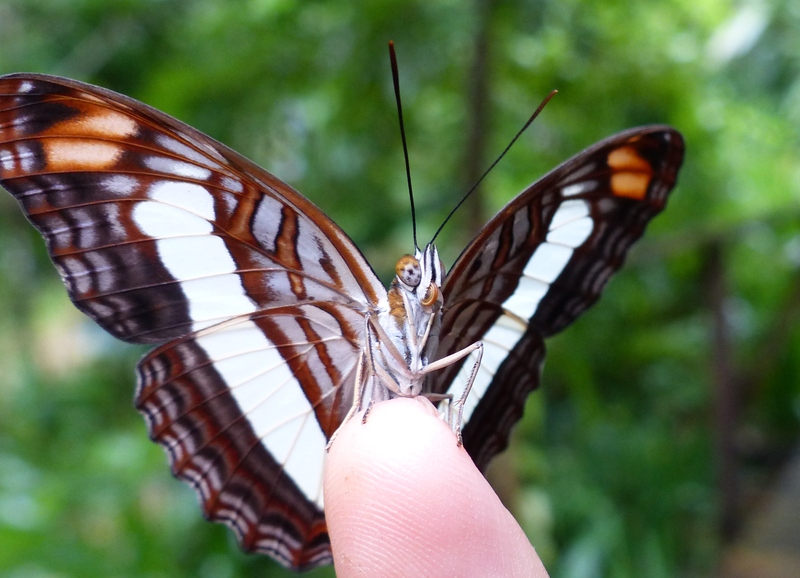 (The only exception to this is the blue morpho caterpillars who do get extra special care… but that’s for another blog post someday). What I’m doing is different. 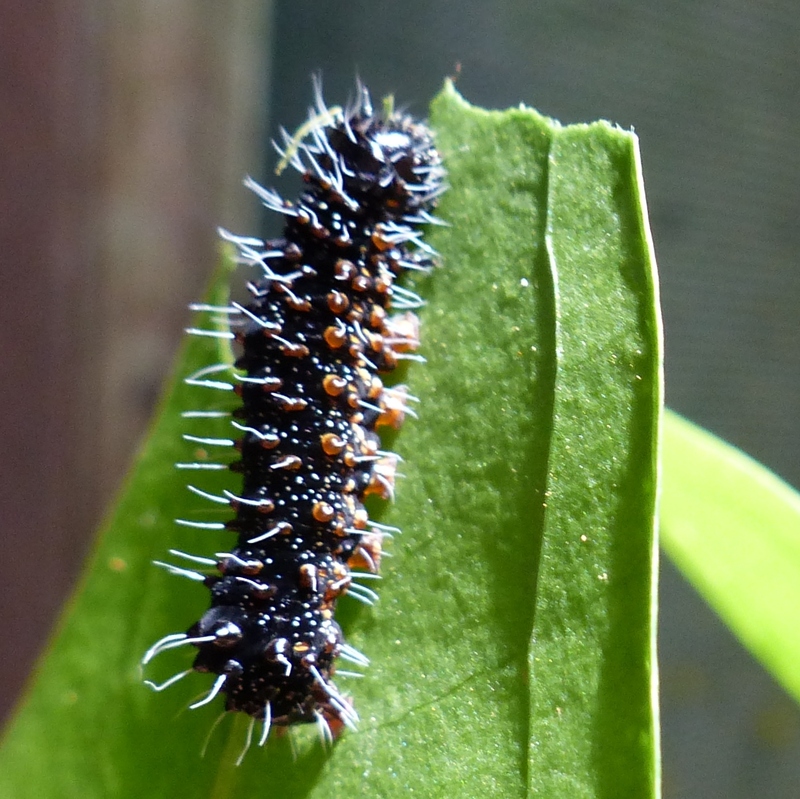 I’m going outside of the butterfly garden and trying to discover new caterpillars whose butterfly alter-egos are still a mystery. 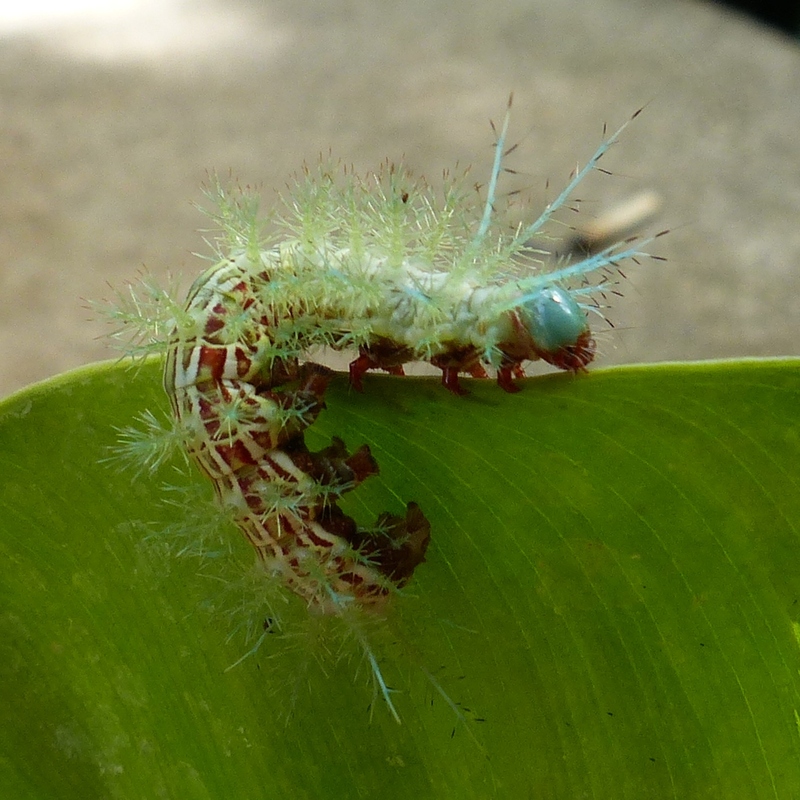 Perla (the cook) and I get really excited when we find new mystery caterpillars and its amazing all of the different forms, shapes and colors they take! 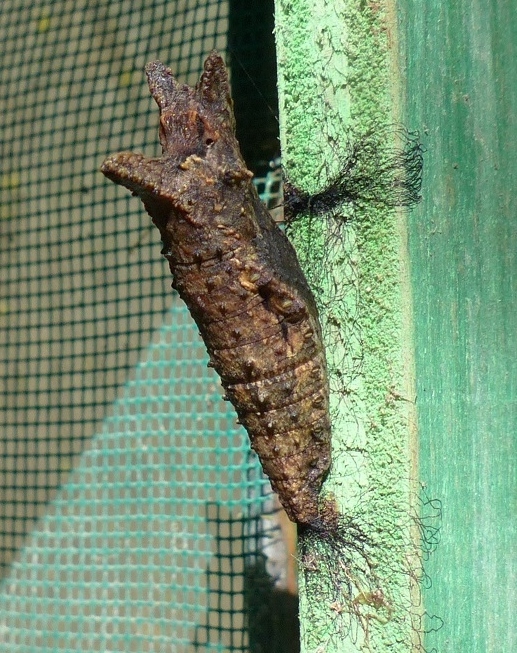 Once discovered we attempt to keep them fed in various makeshift caterpillar boxes until they are ready to pupate and finally emerge as a butterflies. Simple concept. More difficult and stressful to successfully execute then you might imagine! Still I love it! I run to check on them first thing in the morning to see if they’re all still there and if any have changed… sometimes I even wake up in the middle of the night and go check on them. 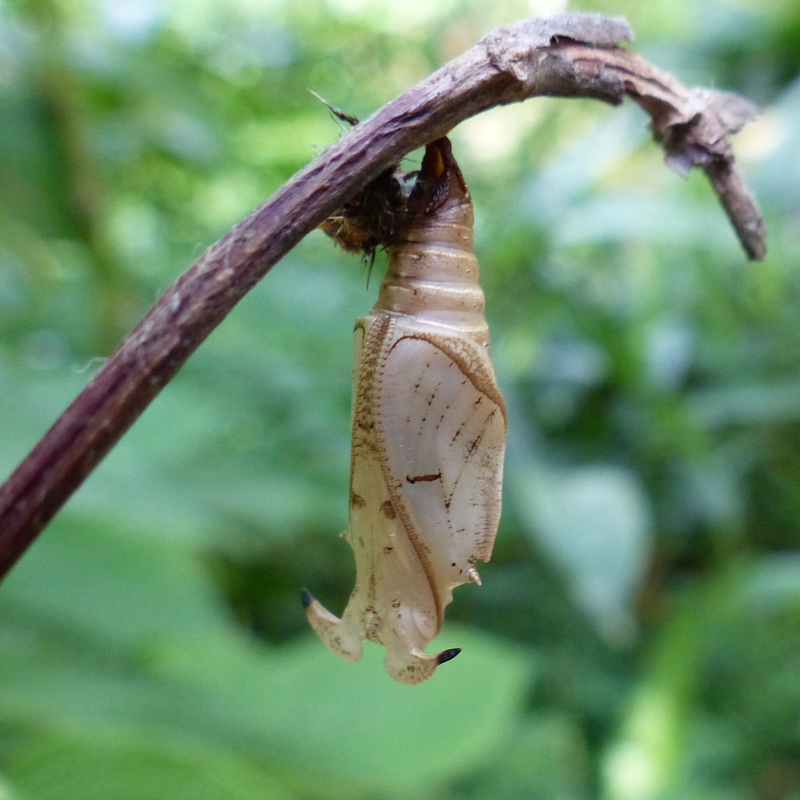 I’m always thrilled when I find one has changed color or started to pupate while on the other hand becoming nearly disconsolate when one is lost. 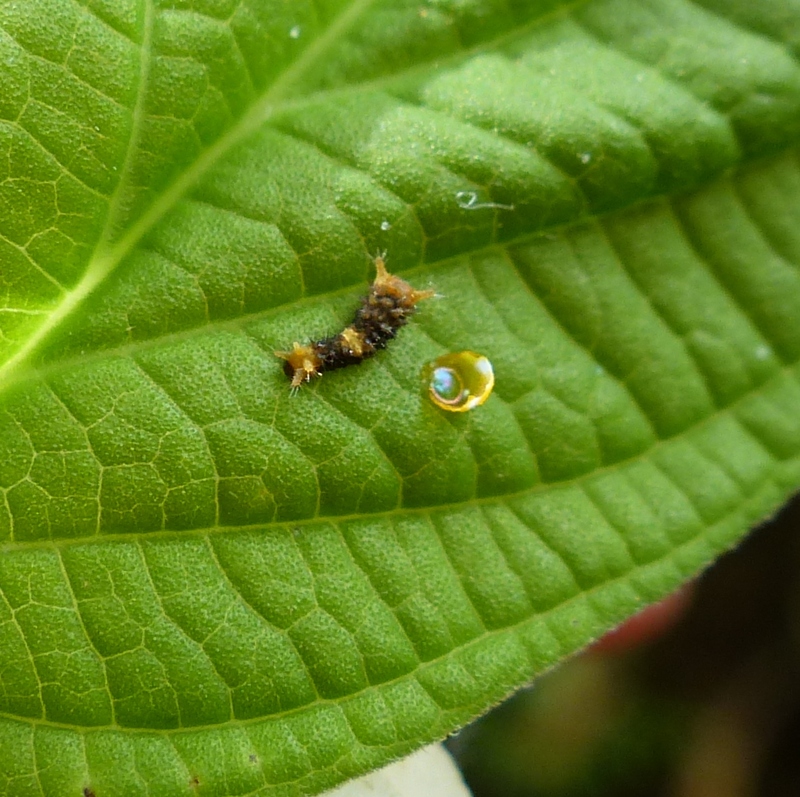 Right now I have 15 different types of caterpillar I’m attempting to raise… I have lost a handful of caterpillars in the last month since starting to do this, but also have gotten 4 to become chrysalises! 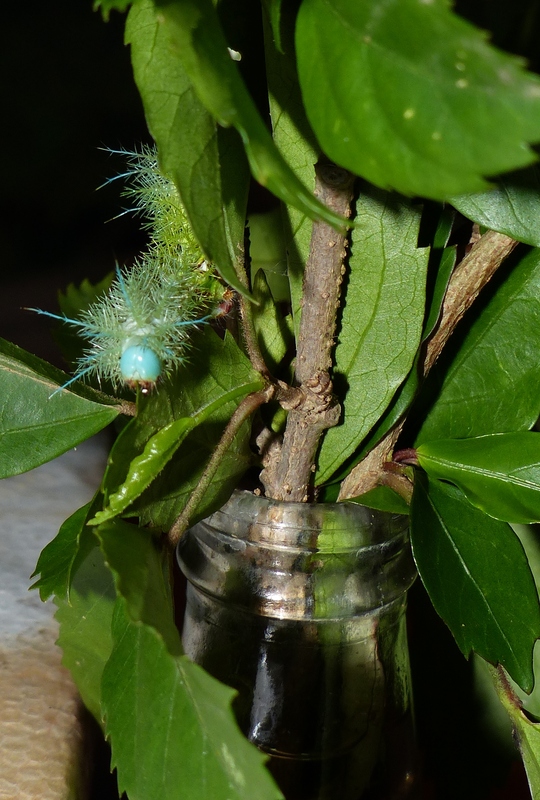 AND as of today, my first mystery caterpillar has emerged as a butterfly!!! 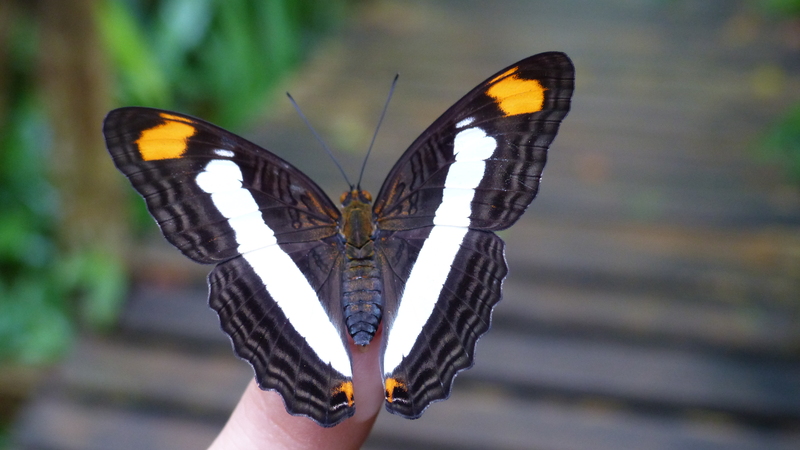 It is no longer a mystery but has a name…The Band-celled Sister (Adelpha fessona). 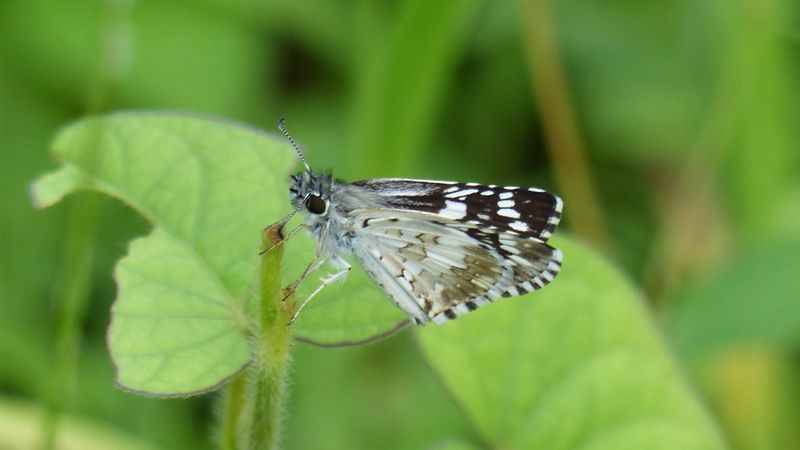 Our newest addition to the butterfly garden! Living here is addicting. This sense that under any given leaf, in any tree, any tide pool, there probably is some new creature you’ve never seen before, that is intoxicating to me. 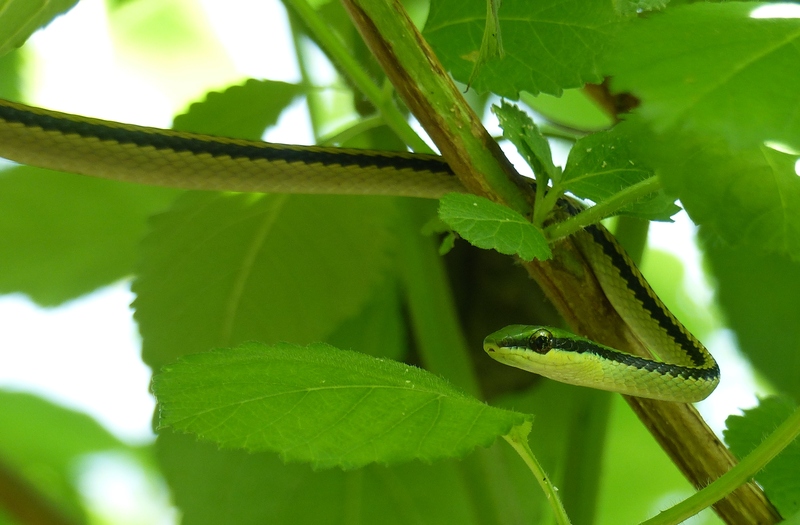 Josh, my fiance, has been living here the better part of the last 10 years and yet still, at least weekly we see some little bug, bird or butterfly he’s never seen before. 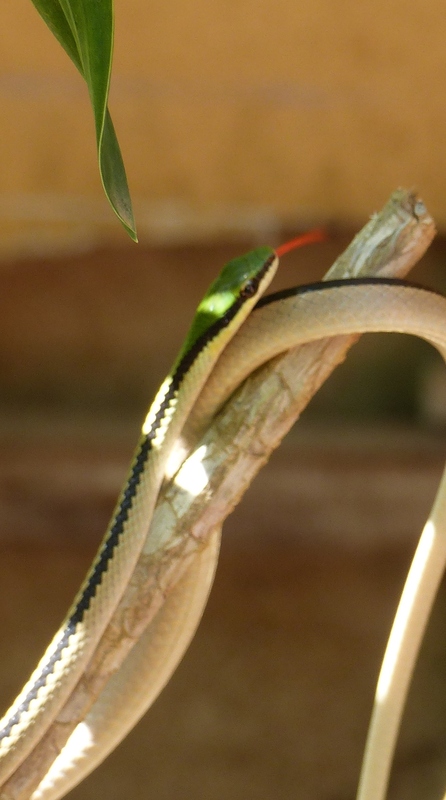 In fact that just happened two days ago, in the form of a long skinny snake with a green head and bright red tongue! 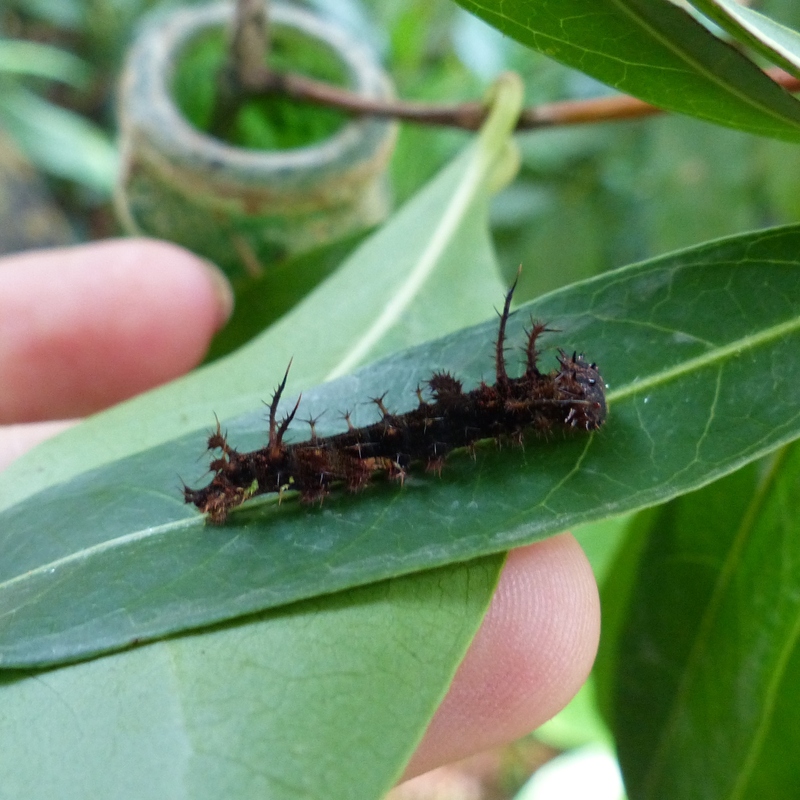 (It had decided to take a tour of our tool shed and caterpillar lab before finding a bush next to the butterfly garden to stretch itself out on like a hammock) Good stuff. My mini adventure today simply consisted of walking for 20 minutes alongside the dirt road in front of the B&B with our cook Perla. 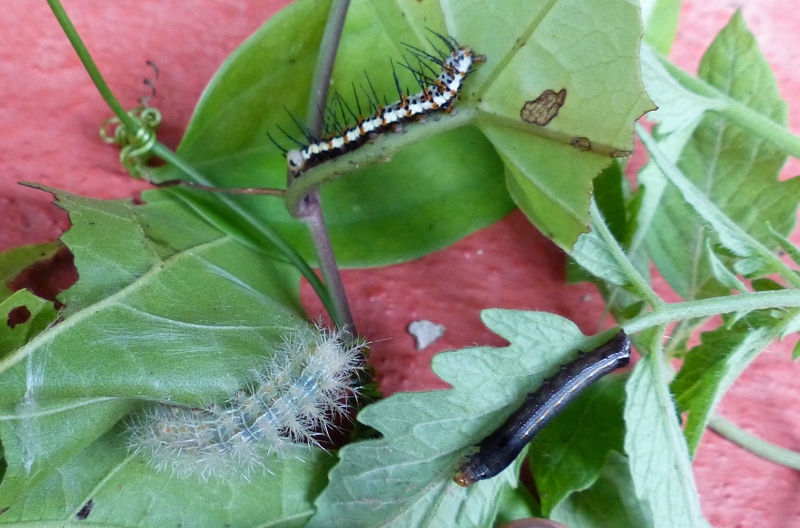 Perla and I love to look for mystery caterpillars which we try to raise. She was walking back home after work and I offered to walk a little ways with her while I tried to find a host plant for one of the caterpillars we’re currently raising. 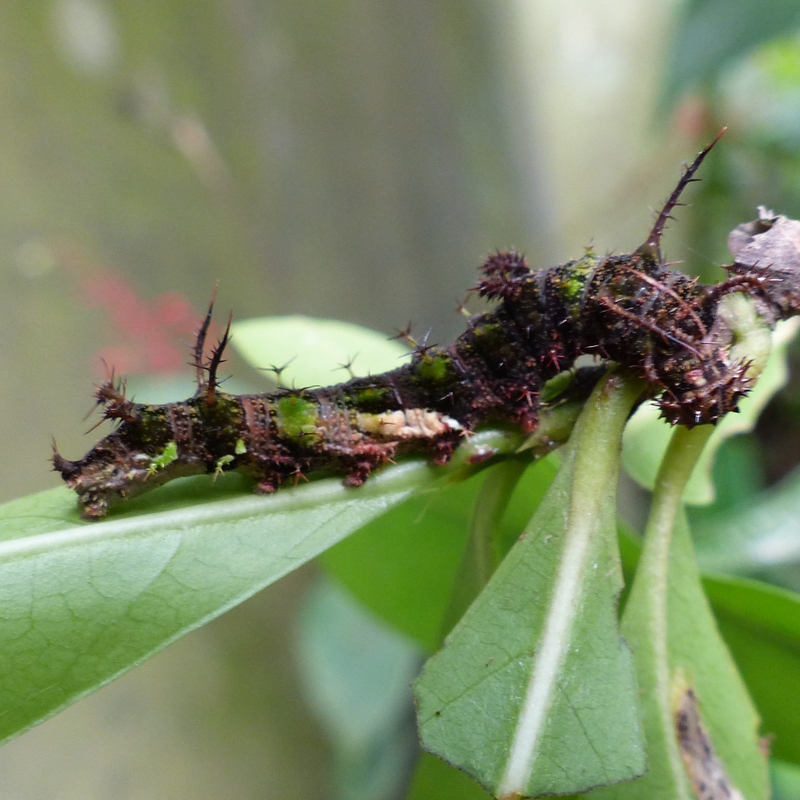 Not only did I find the plant though, to my delight we found 3 more mystery caterpillars! Honestly, just those three caterpillars would have been enough for me to declare this walk the best part of my day. 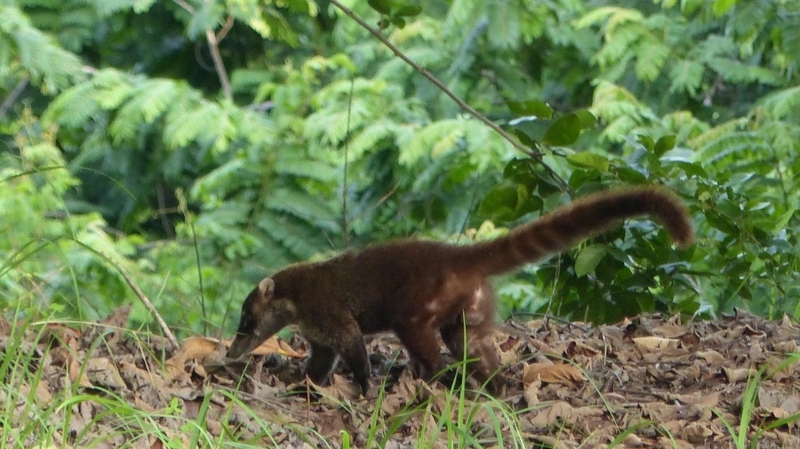 But on the way back I got another thrill, coming upon this Coati passing through a clearing right next to the road! 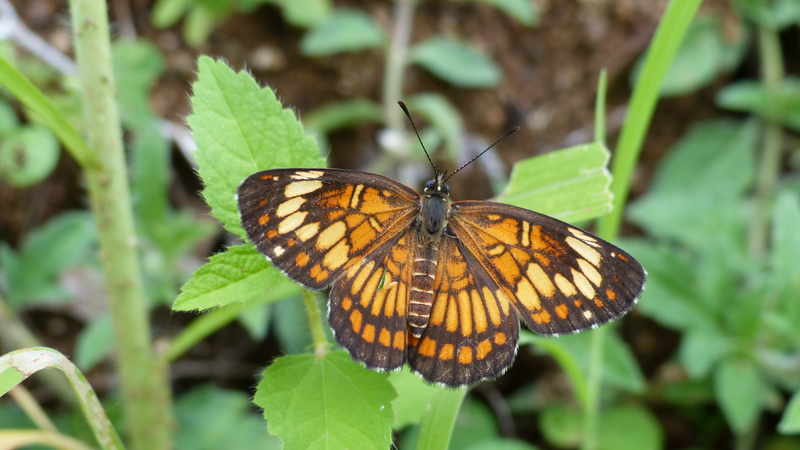 Then as it passed out of my view I noticed two beautiful butterflies at my feet. Its 20 minutes like that, packed with so many little discoveries that for me, makes this place intoxicating. Hi! This is Pauline. I am the fiance of one of the brother’s who owns the family business, Montezuma Gardens. I actually met Josh as a guest here at the bed and breakfast 6 years ago. But after years of long distance dating between Montana and Costa Rica, I’m no longer here staying as a guest. As of 4 months ago I have finally moved down permanently to be with Josh and am helping run the business. 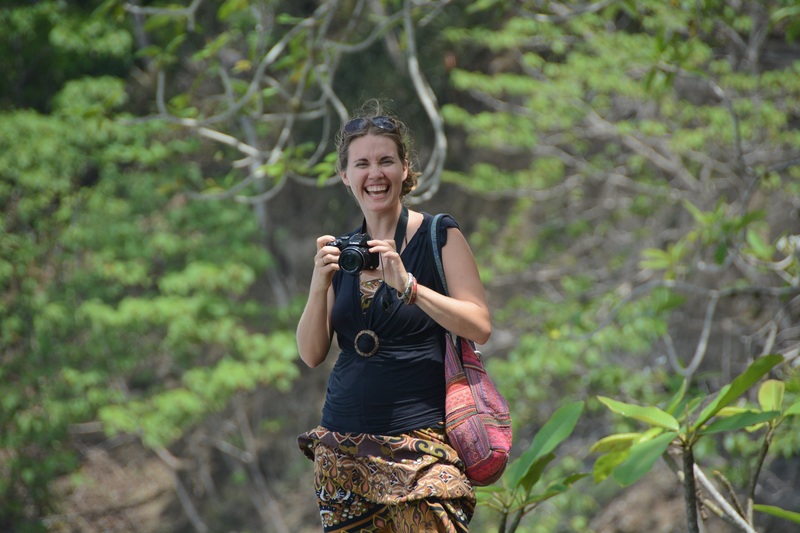 My passions are photography, Spanish, dancing… and whatever new thing I’m getting excited and interested in down here at the moment! This blog will be heavy on pictures with some written explanation of the story behind them as needed! 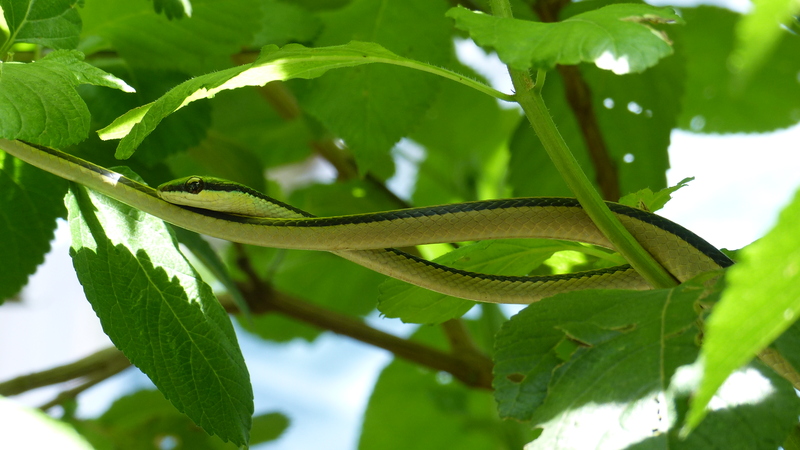 My hope is to give you visual windows into life down here – from the wildlife and scenery around us to the fantastic people you’d get to meet here at the bed and breakfast if you ever come and stay with us! Already in my first 4 months there’s been so much happening around here…. solar panels in the process of getting installed, mystery caterpillars being raised in the butterfly lab, renovating the kitchen, putting up a shade house, planting the organic garden, exciting wildlife sightings and fun daytrips… so much that it finally convinced me there will be more than enough to keep this blog well supplied with plenty of material. Hope you enjoy and remember you’re always welcome to come check it out for yourself! 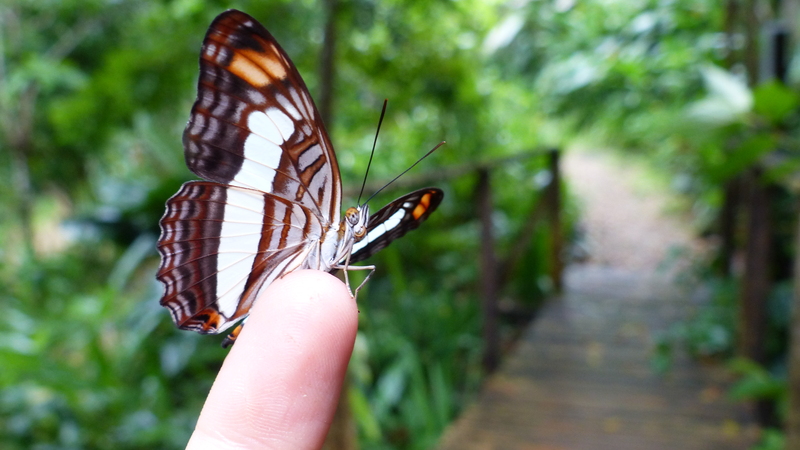 We are constantly trying to improve our little slice of heaven on earth here at the Butterfly Gardens in Montezuma. This year we made an addition to the Hammock area. 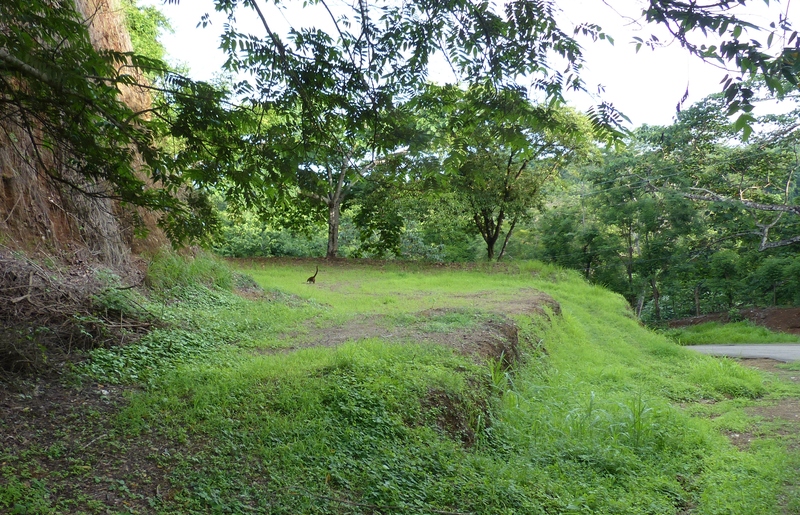 There are 4 places to lay at rest and read a book or have a nice siesta. In en effort to reduce the amount of plastic water bottles used in the area we are now offering one free 18oz Kleen Kanteen stainless steel BPA free water bottle with your room stay. Also, free Agua Cristal water to fill your new bottle during your stay! In 2004 Klean Kanteen® created the first BPA-free metal bottle for personal hydration to give consumers a safe, reusable alternative to the polycarbonate and lined aluminum bottles on the market. We are proud to help distribute healthy re-usable water bottles to our clients and guests. I have to constantly pinch myself while living here in Costa Rica. Am I really here? Is this really happening? It is, and I love it. Everything is surreal and you are constantly in perpetual motion. As soon as one project finishes the next appears. It keeps you on your toes and it keeps you young. The sun fills you with joy and warmth everyday and the moon completes you with stillness and peace. A constant compliment of twelve hours each to give you total balance. I love Costa Rica!